A year ago, I was the kind of girl that couldn't run for 45 seconds without gasping for breath and giving up before I got to the end of the road. My goal for last year was to change this. I admit it, I was envious of the kind of people that could make running endless miles look so effortless. I liked the promise that running would bring- stronger legs, a clearer mind and ultimately, that euphoric combination of endorphins and reaching a goal that once felt impossible. So I did something I never thought I would and I signed up for my first 5k. It was a fun run, in more ways than one. The Color Run- trademarked as the ‘happiest 5k in the world’ involved a 3 mile race along Brighton’s seafront whilst being showered with powdered paint in varying colours. Whilst I didn’t train as much as I’d liked, I ran with one of my closest friends and we stuck together along the course. Whilst dragging my legs through the last kilometre, the voice in my head urged me to promise myself that I wouldn’t run again. I wasn’t a natural born runner and I’d done it now, hadn’t I? Running was something mad people did on early, wet mornings in unattractive sports apparel. This year, I find myself signing up for more 5k runs. I find myself hovering over 10k courses and pondering on whether I’d ever be strong enough, both mentally and physically, to complete a half marathon. 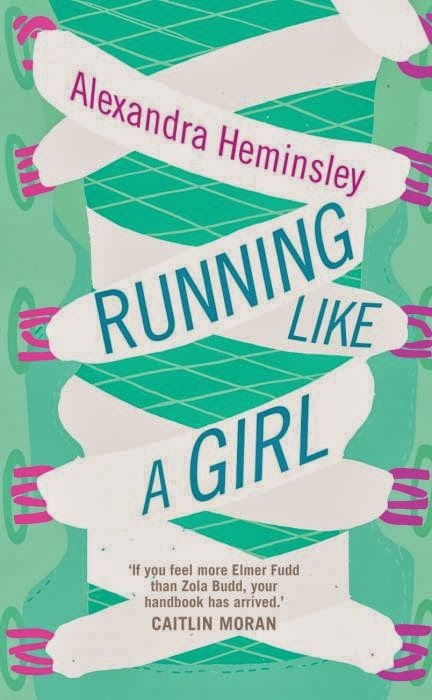 In a post-christmas state, I impulsively downloaded Alexandra Hemmingsley’s Running Like A Girl. Alexandra, or ‘Hemmo’ as she is known, writes honestly and sometimes graphically about her experiences from non-runner to marathon-completer. Full of wit, brilliant anecdotes and genuine heartfelt sentiment, this book captivated my attention throughout (and also left my boyfriend feeling bored through constant chapter updates.) Refreshingly, this story wasn’t about a natural athlete, it was about a self-confessed ‘curvy girl with little or no competitive spirit.’ Something I’m sure most of us can relate to. With each run on the horizon, the story followed Alexandra as she attempted to train effectively whilst also silencing the little voice in her head that told her she would never be able to complete her race. From someone that has merely walked up Arthur’s seat on a blustery day, the fact that she would attempt to run up and down it left me feeling awe-struck. Here was a woman that years earlier, could not run a mile without longing for home. A favourite part of the book for me, (and I’ll try not to ruin it too much), is the run through San Francisco. For the time leading up to the run, it is the view of the golden gate bridge that keeps her going. The fact that she has used something that she is so passionate about to see some beautiful parts of the world is what makes it so inspiring. What is also wholly inspirational, however, is the stories about pioneering young women that fought to complete in running events that they weren’t allowed to. Women who snuck into races, refused to adhere to petty rules concerning gender and campaigned to change the rules for women across the world. Did you know that women weren’t allowed to compete in long distance running until the 1960s? See, a history lesson for you too. The second half of the book is a must-read for anyone thinking about taking up running. From choosing your first pair of running trainers, the importance of sports bras and how to fuel your body before a big race, Hemmo has it covered. Best of all, it is written in a style that doesn’t preach, doesn’t condescend and doesn’t exclude. It also has a section of the greatest myths about running. Apparently running doesn’t ruin your knees? No excuse, then. As well as a great read, this book inspired me even more to grab my trainers, get outside and push my body to see what it can do. I may not be running marathons any time soon, but I won’t be holding back. Blogging about books, beauty, health and adventures.